More than 500 percussionists put their rhythmic accuracy skills to the test this weekend in Pasadena, Calif. at the last and largest World's Most Accurate Drummer contest of the season. 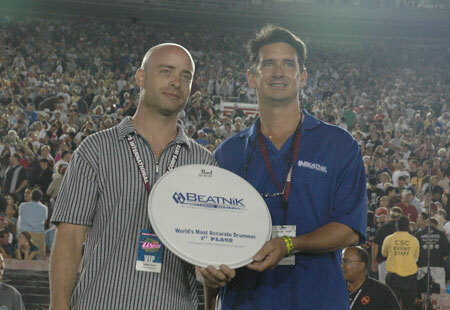 After warming up on practice pads, participants were given a two-bar rhythm to play for two minutes on an official Beatnik Rhythm Analyzer electronic drum pad which scored each competitor on their rhythmic accuracy. A perfect score in the competition was 800 points, and the top three scores from the three day event scored in the low 700's. Erik Truelove won the World's Most Accurate Drummer contest in Pasadena, Calif.
Erik Truelove, 37, a professional drum set player and teacher from Tucson, Arizona won the three day competition with a score of 737. Truelove was scheduled to fly back to his hometown on Saturday for a performance, but after earning the highest score on Friday night, he changed his plans and rescheduled his flight so he could stay for the rest of the contest. "It's really amazing to win this competition and the feelings I have right now are indescribable," said Truelove. "I was incredibly nervous when I competed at the booth though. I've been practicing for this a lot and when I got here I knew the pressure was on and the competition was fierce. But now it just feels great to win this, especially at the World Championship competition." The World's Most Accurate Drummer contest, sponsored by Beatnik Rhythm Analyzers, named five winners from all over the country this summer and was a fun and exciting experience for all those who participated. For more information on the Beatnik Rhythm Analyzer, visit Tuners.com.